the Compass Cay Marina dock. 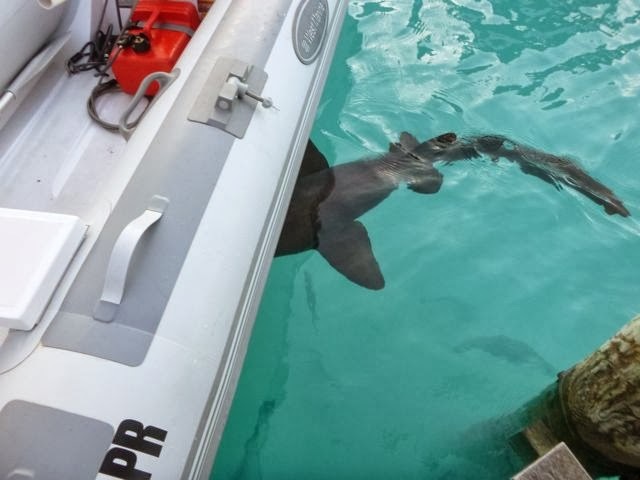 “They’re our pets,” Jonathan of Compass Cay Marina explained, nodding at the swirling sharks working their way on top of their dinghy dock with the rising tide. “Meet Our Pet Sharks,” encourages their sign. 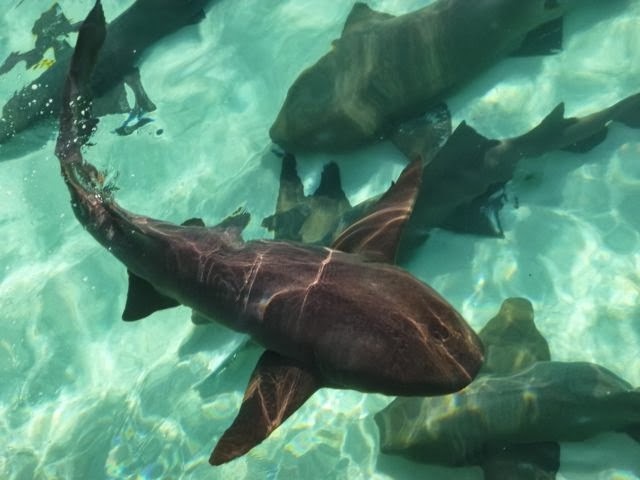 Indeed, they’ve named each of the dozen or so friendly nurse sharks who cozy up for treats… Mutt, Woody, Hook, Squirt, and Scar are a few in the gang. They wiggle and waggle up like friendly kittens. Their skin looks velvety, so I satisfied my curiosity and petted one. The texture was like a150-grit fine sandpaper; still softer than a cat’s tongue. of feeding time at Compass Cay Marina. 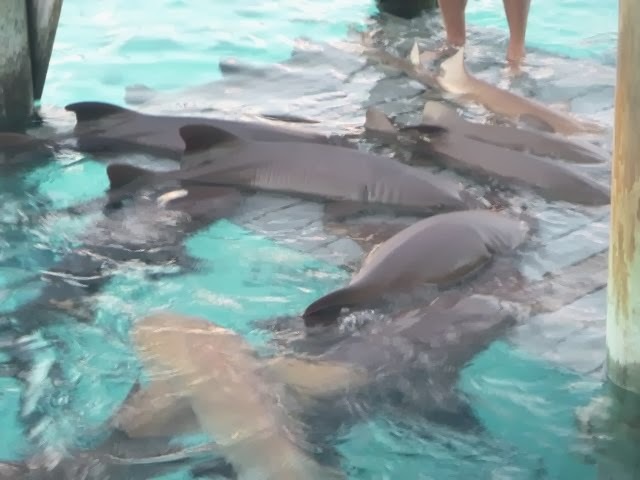 I know nurse sharks don’t attack humans. 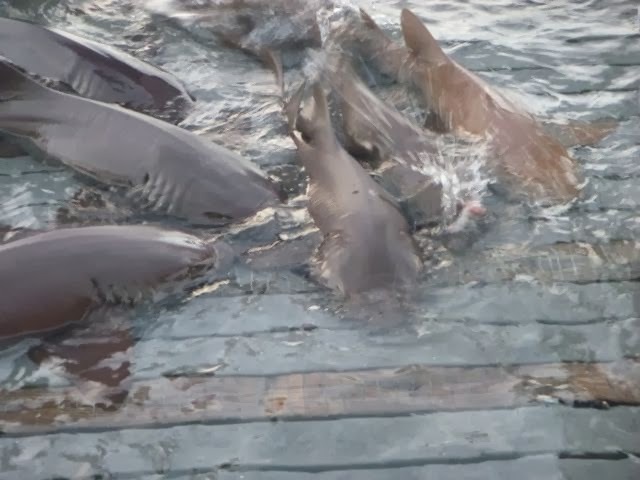 Still, it’s disconcerting when there’s a dozen jaws at feet level, all swimming in the same watery plane. 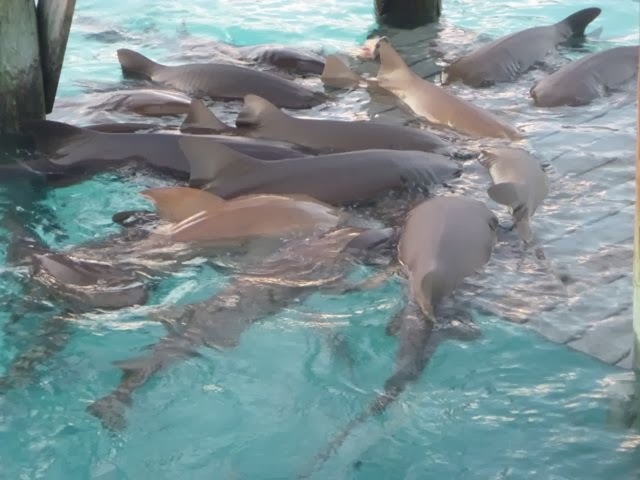 When we watched their feeding from the high dock at Highborne Cay, several days earlier, I did not want to encounter them on my swim from the beach to our anchorage. I swam that as swiftly as the time a Doberman chased me at the track, back in my days as a runner. In fact, I was back at the boat on the foredeck before Wayne motored the dinghy out of Highborne Cay’s harbor. Back at Compass Cay, We weren’t at all concerned about our safety (at least not from the sharks -- but that's another post!). Our biggest worry was not getting our dinghy motor too close to the gang; for their safety. Feb 16, 2014. BAHAMAS. Prescheduled Feb 15 2014 from Warderick Wells Cay, Exumas (N24.23.624 W.76.37.975). These posts were photographed in Highborourne Cay (N24.42.303 W.76.49.325) Feb 8, 2014 and Compass Cay (N24.15.273 W.76.30.825), Feb 13, 2014, both in the Exumas. Next stop: TBD – most likely Staniel or Major Cay, the Exumas. swallows its treat. The others? Close, but no cigar. 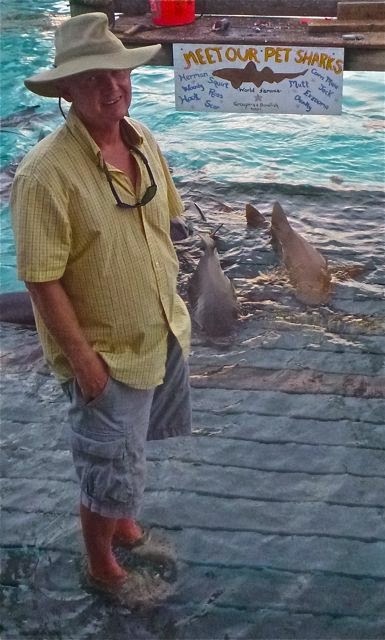 Wayne at Compass Cay Marina. and definitely not with them!